Sometimes, in life, you win. Whether it's a pay rise, new friend or a simple compliment, we, as human beings like winning. In nail art, sometimes you win and end up with a gorgeous design. People on and off the internet ooh and aah over it and you feel successful, proud. And sometimes you lose. Sometimes you want to throw all your polish in the fire, break your brushes in half and be nail-naked forever. This post is dedicated to the failures. These are the designs I've created that were meant to be banished to a folder deep inside my computer for eternity. But despite the bad memories of hours wasted, nails destroyed, intense frustration and broken confidence, I have decided to post these. Because honestly, while some of them are shocking, they are also hilarious. Without further delay, I present the uglies! The main problem here is that they were too messy to be proud of. It's no surprise that three out of four are watermarbled - I hate cleaning up after that! cuticles are underneath all that mess? either. Unfortunately this design had both... Eurgh. white underneath was showing through and the cuticles were yucky :(. I should probably note that I'm not saying that having messy cuticles means your nail art is crap. It just looks a bit untidy, and I'm quite a stickler for clean cuticles in manicures. This whole thing is just to have a laugh at the expense of myself, so don't feel that your nails are bad just because I judge mine! it at all. Too bright, too "look at me, I'm 12!" NOT turn out the way I wanted and nothing matched. I fixed it, here's the new version. that as it's humanly possible to be) but I wasn't at all happy with them. inspired by the song Katniss sings to Rue while she's dying - the meadow one. There's just nothing that's okay about these ones. I don't even know what I was trying to achieve here. Stahp, it hurts my eyes! A classic example of "too much." A lot too much. remember it clearly. Hours of painting gone to waste on nails that I hated! So, what's your opinion on these nails? The best and worst? Do you also have a folder of shame in your computer filled with ugly nails? If you do an "Uglies" post, let me know! Also, note my new URL! 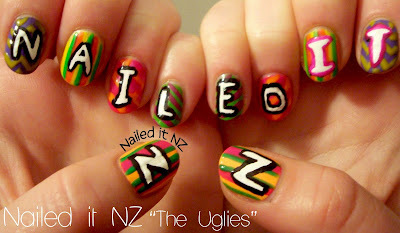 My blog is finally www.naileditnz.com! Before it was nailedit1.blogspot.co.nz and that was just ugly as well. Very happy with this latest blogging achievement. I have heaps of reviews coming soon! Born Pretty Store, KKCentrehk and a whole new collection from Maybelline! There's many more that didn't even make it to a photoshoot. Thanks! Yeah they were probably the least bad... :). I checked out your tag, some of them are actually very cool! Beauty is in the eye of the beholder, I guess. I have many that I didn't dare take photos of either! I don't even usually get a chance to photograph them before I'm wiping them off :) Watermarbelling is def in there with my uglies - I think my nails are just too short or something cause it looks like sh*t! And cloud nails, not my thing either! Sometimes I'm the same - I might make sure I photograph them every time now though, this post has been quite popular! Nail art can be so tricky. And thanks! I actually really love the black water marble!! Don't know why. Most of your 'worst' are better than my 'best'! Everyone's got their own tastes, I guess! Aw thanks :). I'm sure yours are fine! I like The Hunger Games nails. Bahahaha! Thankyou for this, makes me feel better that I also spend hours on a design, then go "Oh what a horrid waste of time", ok maybe not that ladylike. Gave me a much needed giggle! Haha yeah I'm not that ladylike about it either :P. I'm glad you enjoyed this post, thanks!! You know, I'm really glad you showed these. I thought it was just me who had moments of looking at my nails and thinking, "Well. This is rubbish."